Let's continue our journey in the archives of V&A with this fabulous red coat in full New Look style. 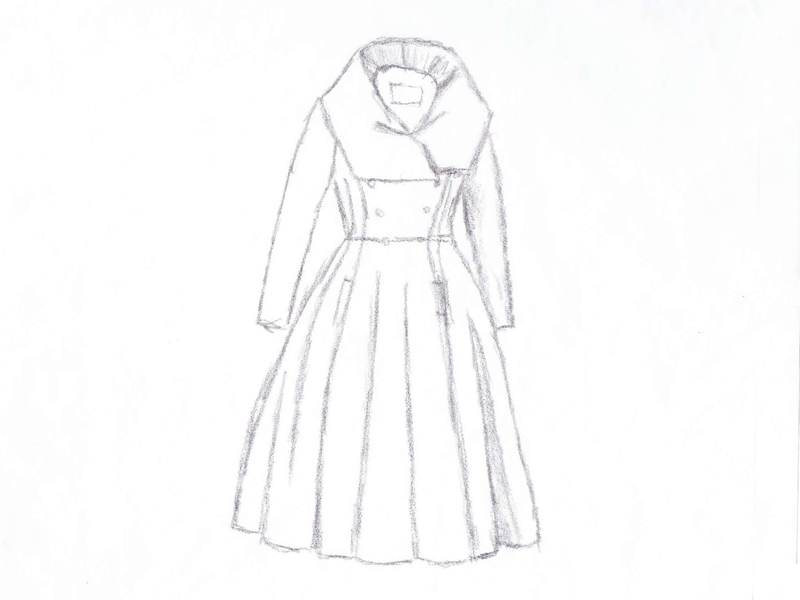 It was designed by Hardy Amies in 1947-1948. I wanted to see some real New Look items, and it didn't occur to me until the coat was there in front of me how much it resembles the coat I had just finished... Well, great minds think alike. In this case, me and Hardy Amies. He was a very handsome man, starting out at Lachasse in London in the 1930s and then, after the war, opening his own couture salon on 14 Saville Row, the of home of bespoke tailoring. And that's what he did for both men and women - and Queen Elisabeth II. You'll still find them (Amies, not the Queen) there; it's the only couture salon in London surviving from the post-war era, continuing dressmaking as well as men and women's tailoring for private clients. The coat is made of an amazing crimson red wollen cloth, with a huge shawl collar (there must be something fluffy in it to keep the shape. Tulle? ), a slim waist and a huge amount of fabric in the skirt (I would estimate about 4 or 5 metres at the hem). I actually think I could wear it; it's not at all as tiny as the suit. It's double breasted with shiny round silver buttons, and hand sewn button holes that actually didn't impress me at all. They were rather messy - I've made better myself (that's strange to say...). To help with the volume, the entire skirt is interlined with hair canvas. Since the lining wasn't attached to the hem, I was able to see it from the inside - and it looked like a big puzzle. Obviously, they used all little pieces of hair canvas they could find... The wide hem - about 5 cm - is catch stitched to the hair canvas. The lining is a red silk crêpe with Hardy Amies woven into the fabric - very elegant. As I suspected, there was a lot of small hooks and eyes to keep everything in place, and also a waist stay to help support the skirt. What I found rather surprising is that the last button hole, in the waist seam, wasn't a button hole at all but just an opening in the seam. That's something I would consider, and then think, nah, it's cheating. Obviously not. There's no need to say I would love to wear it - I mean, I made one for myself! All in all, there will be seven parts about me in vintage heaven (also knows as the archives of the V&A at the Clothworkers' Centre).